Do you love chocolate covered cherries? I sure do! 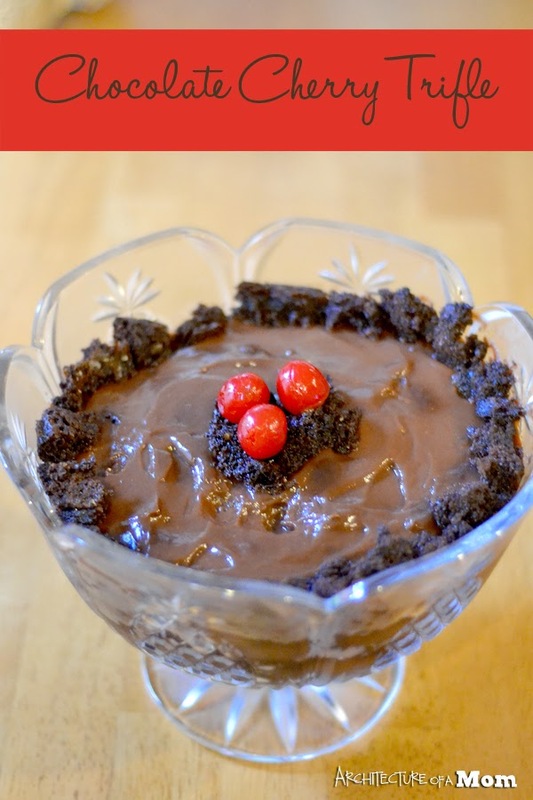 If you love them, then you will love this Chocolate Cherry Trifle. Even better, all of the ingredients are common items--and everything except the eggs and milk are pantry items! You're going to love how amazing an rich this trifle is...and how easy! Mix up your brownies per the box directions and allow to cool. While the brownies are cooling, use a strainer to separate the cherries from the juice. You will need both, so be sure to reserve the juice. Mix up the milk and pudding per package directions. Chill in the refrigerator for at least 5 minutes before continuing. Once the brownies are cool and the pudding has reached a soft set, you are ready to assemble your trifle. Cut up the brownies into bite size pieces. In the bottom of your serving bowl, place a layer of cut up brownie bites. Depending on the shape of your bowl (tapered or straight sided), you will use around 1/3 to 1/2 of the brownies. Pour around 1/3 to 1/2 of the cherry juice into the brownies. Spread on about half of the pudding. Arrange the cherries on top of the pudding (retain 3 for garnish). Add the rest of the brownie bites (retain a little for garnish). Drizzle with the rest of the cherry juice. Spread out the rest of the pudding. Garnish with the rest of the brownie bites and cherries.